Dave - Turbulence occurs in fluids and one way we often transport fluids around is in pipes. 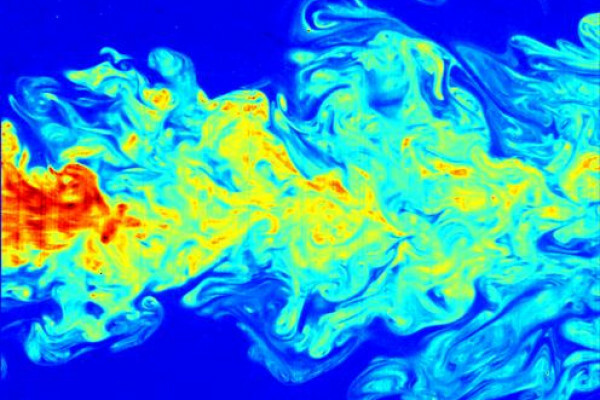 Tobias Schneider is a researcher at Harvard University and he studies turbulence in pipes. Hello, Tobias. Dave - Is turbulence a big problem in pipes? Tobias - I guess it is. If you transport oil through pipelines or water through city water mains then it just costs much, much more energy if the flow is turbulent, so you want to terminate turbulence in these kind of systems. D ave - I guess, turbulence, it swirls. That's happening in three dimensions, so is it difficult to study because it's hard to kind of see and separate everything out? Tobias - Sure. So what you have to do basically is set up a simple experiment to do that and that's basically what we did. Dave - So what exactly where you doing? Tobias - So we were setting up an experiment where we had water flowing through a glass pipe - a long glass pipe about 12 metres long and 3 centimetres in diameter or something like that, and then we created a patch of turbulence in this pipe. So a local region, which is also known as a turbulent puff, that moves downstream within an otherwise laminar flow. Dave - So, did you have to actually trigger the turbulence yourself or would it develop naturally? Tobias - No. In this case, it didn't develop naturally so if you have a very smooth pipe then you have to perturb the flow, so we injected a little bit of water into the pipe that then generated this turbulent patch that travels down the pipe. Dave - So it's one of these things where you start all off the little disturbance and the disturbance gets bigger, and bigger, and bigger, and in the end, you get problems. Tobias - Exactly. So, our question then was how we can make this turbulent patch that we generated, how can we make that vanish? That was basically the goal of our study. Dave - So what did you end up doing? Tobias - So we have this one turbulent puff and the answer of how to make that vanish sounds somewhat paradoxical. So, to an eliminate turbulence, we basically had to create more turbulence and what I mean by that is - we had this one puff and we created more puffs at regular intervals and the trick then is that if these puffs get close to each other, close enough to each other, then they start affecting each other, and they decay. So really, more turbulence can lead to less or in our case, really no turbulence. Dave - So were you actually getting rid of all the turbulence or just changing the scale of it? Tobias - No. In our case, we were actually getting rid of all the turbulence. So the flow at the end of the pipe was completely laminar and that's kind of the thing that we are really excited about. We didn't only reduce the level of turbulence, but completely eliminated it. Dave - So would it work in an actual real-world pipe which isn't as smooth as your one or would it just work in this beautifully smooth pipe? Tobias - Okay. That's a slightly difficult question. So in our experiment, it works for pipes up to a certain flow speed. At higher flow speeds, we were, up to now, not able to do it in an experiment yet, but we have computer simulations which suggests that similar things might also work in pipes when the velocity is higher, so it could actually work in real pipes. Dave - So the puffs you're adding, where they exactly the same as the puff you were using to create the turbulence in the first place or was there anything special about them? Tobias - No. The puffs are basically the same and that basically leads to kind of a question of, why can we destroy turbulence or what is the mechanism about that? We tried to investigate exactly that and in order to do that, what we basically did is we did an experiment where we visualise the flow. We measured the flow using a laser-based measurement technique and we looked at basically how this puff works, so where it gets it's energy from. So what we basically found is that the turbulent vortices and eddies that power turbulence are created at the rear end of this path. So they are created at the interface between laminar and turbulent flow. So it turns out that the energy source that basically powers this turbulence requires laminar flow behind the puff. There is no longer laminar flow, but you add a second puff, then this energy input ceases and the turbulent vanishes. Dave - So you have to keep on adding these puffs forever or can you somehow get it weaker and weaker, and weaker and actually kill it in the pipe entirely? Tobias - Basically, you have to add these puffs at a certain spot in the pipe locally, but then for the downstream of the pipe, you don't have any puffs anymore. One can probably explain that with this imperfect analogy, but think of this turbulent puffs as a sailboat in a regatta. At a certain point, what we do is we constantly start new sailboats that enter this race. After some time these boats sail so closely behind each other, that the succeeding boat takes the wind of the sails of the boat in front of it and that basically means that the whole entire regatta comes to a halt, and we don't find any boats downstream, or in our case, we don't find puffs downstream. So we have to add the puffs all the time, but downstream, you don't have any more. Dave - So in a real world situation, you would just sort of envisage having a pipe with a whole series of these kind of puff inducers and therefore, so it would break up the turbulence every kind of 100 metres or so, or whatever, and therefore, everything would flow a lot more easily. Tobias - Exactly. So that's the idea here. Dave - Would this work in any other examples or other place where turbulence is a problem sort of in cars, aerodynamics, and things like that? Tobias - Yeah. That's basically what we hope we can do. Right now, this is a proof of concept experiment. So right now, we can only do that in pipe flow and we cannot yet do it in more relevant problems like the wing of an airplane or something like that. But we're super excited about our results because it shows that, in principle, turbulence can be completely eliminated. It's still a very difficult task and don't expect to have cars with reduced turbulence in the next 10 years or so, but we are very confident that we can get closer to this.